This property was wonderful - a perfect blend of fun activities for kids while still feeling like a retreat for adults on vacation as well. Very clean and all staff were very polite and personable and went out of their way to make the vacation fun and memorable for both kids and adults in our party. Hotel and resort was great. Water park was perfect for kids. Staff was fantastic. Beach was not perfect, but a great place to relax. There is a"car sales-like" pitch from the parent company to buy into their membership which was a total waste of time and tainted my resort experience. I would recommend the resort not to include this aspect when we are paying a lot money to stay at their resort. Overall, great family vacation. A few things that were a negative. First, know that they are going to sell you hard on their "club" (time share) and if you tell them you are not interested, they are insanely rude! Most of the staff was pleasant, other than one particular conceriege named Anthony, he was the one that was rude after we said we wanted no part in buying into time share. Spacewalker was over-rated. The concept is cute, but doesn't meet expectations. Verdello was yummy, sugarcane buffet is great and lots of variety. Room service was good as well. Dobbio coffee shop had lits of yummy treats. The beach party buffet had the best food! Nickelodeon place was great for the kids. Just know to bring your child's floaties. They do a mass sliming everyday, so if you dont want to fork over $85, it's a fun option. Swim up rooms are great, they have a half length door you can lock for safety. Just beware some are in the shade all day. We had room 4112, shady most of the time, but rooms on the other side got good sun. We would go back again. Great for the kids and adults too. Cleanest place I have ever been. Everything is spotless. Lots of food choices and fun activities for kids. Nickelodeon characters are around, but not intrusive or overwhelming. everything was great exept we got food poisoning i ended up vomiting and in the enfermery, my husband and two aditional friends were in the same condition. really bad. I was not satisfied with thereon accommodating attitude the manager displayed when I spoke wither about my nephew's unhappiness with the water park closing for hours on our next to last day stay. then when he was allowed back in, the water park closed. After leaving the water park, we attempted to satisfy my nephew's love for the water, we went to the pool where we were shortly removed from by security. When a main attraction is closed, there needs to be some sort of accommodation made for patrons to supplement for the loss of the enjoyment of that attraction. Not to mention that my 6 year old nephew was only truly interested in the water and the disappointing news made him cry and then when removed from the pool made him cry again. Strong suggestion, managers of such nature should be trained to offer some sort of customer friendly gesture when dealing with patrons that have disappointing children and not appear so unempathetic to customers who pay to enjoy their facilities and don't get to do so. Moreover, the water park was closed totally on our last day there. This was an even bigger problem. This trip was particularly planned for my 6 year old nephew who enjoyment was limited versus accommodated. SHAME on Nickelodeon resort for ruining my nephew's experience. It was Just OK. For a nickelodeon Resort it does not feel like one. Besides the water park, you really cant tell in the resort if its a nickelodean theme. Family friendly hotel. Kids and parents have a great time Hotel staff very entertaining and engaging with children. Just kidding staff amazing with children. All children wanted to return to see what fun activities they had planned. Fun nightly activities for kids as well as adults ( e.g. beach party,magician,character show). Pleasently pleased with variety of food. Having visited the DR on 3 other occasions, I have to say this was by far the LEAST enjoyable stay. My husband and I used the words "starving" on more than one occasion during our trip! Unlike other resorts we visited, this resort did not offer a lot of food choices and there were times during the day that NO FOOD WAS AVAILABLE AT ALL. Three "RESERVATION ONLY RESTAURANTS" were a joke because for the entire week of our stay, NOT ONE RESERVATION WAS AVAILABLE! We ate all our meals in the "Buffet Restaurant" and that got pretty tiresome and repetitive by the 6th day. Aside from the waterpark, I don't know what qualifies this as a kids-orientated resort. There was very little for kids to do all day except stay at the waterpark and visit the Sports Hub, which had ping pong, air hockey, pool and foosball. That entertained us for about an hour. It was a long walk from the main resort to the water park, and then another long walk to the sports hub. Trolleys were advertised, but very rarely came to provide transport, and we had to walk to every destination. As with every resort, some staff members were exceptional, and some, like the personal concierge assigned to each section of rooms, were not at all helpful. This was a pretty disappointing experience, considering the price tag was the same as a stay at Hard Rock, which had non-stop food, activities, pools, and a very lively atmosphere. We would not return to this resort. Nickelodeon Hotels & Resorts Punta Cana, Gourmet All Inclusive by Karisma places you 5.5 mi (8.8 km) from Macao Beach. This 208-room, 5-star hotel has a full-service spa, a free water park, and 9 restaurants. Free buffet breakfast is included with your stay and awaits you each morning from 6 AM to 11 AM. This hotel is home to 9 onsite restaurants, perfect for a quick bite to eat. Order from 24-hour room service to satisfy your hunger without leaving your room, or explore the hotel and get a beverage at the bar/lounge or coffee shop/café. Guests can expect to find free WiFi and 42-inch a flat-screen TV with digital channels. Beds sport premium bedding and the bathroom offers a hair dryer and free toiletries. Other standard amenities include free minibar items, a balcony or patio, and an MP3 dock. Guests of Nickelodeon Hotels & Resorts Punta Cana, Gourmet All Inclusive by Karisma have access to a full-service spa, a free water park, and an outdoor pool. Free valet and self parking are available, or if you're not driving, take the airport shuttle (available 24 hours) for USD 80 per person one way. Multilingual staff at the 24-hour front desk can assist with concierge services, dry cleaning/laundry, and luggage storage. Other amenities at this beach hotel include a children's pool, a fitness center, and a spa tub. Dear Kristen, thank you very much for this review!! We are delighted to know you and your family had a wonderful time while with us! We hope to receive you soon in our hotel! Dear Anonymous , Thank you very much for the 4 stars review!! All-inclusive room rates at Nickelodeon Hotels & Resorts Punta Cana, Gourmet All Inclusive by Karisma are available. These rates are higher because they include onsite food and beverages in the room rate (some restrictions may apply). Free buffet breakfast is served daily from 6 AM to 11 AM. 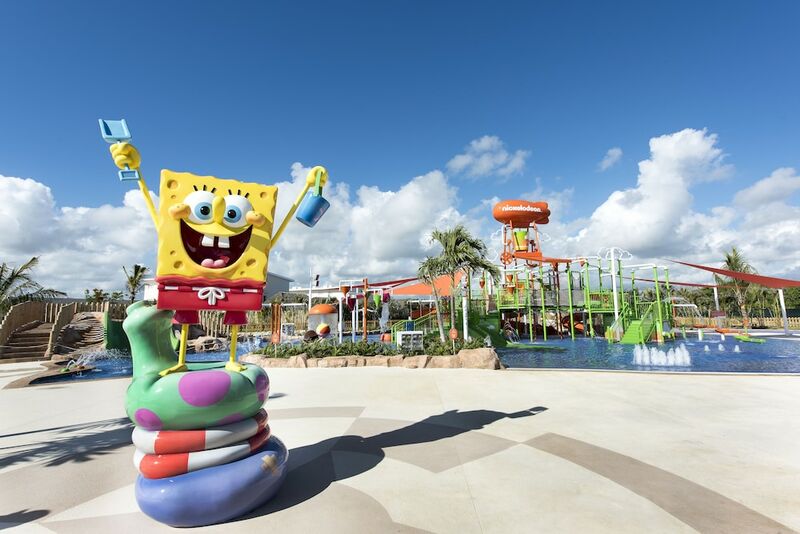 Recreation features at Nickelodeon Hotels & Resorts Punta Cana, Gourmet All Inclusive by Karisma include outdoor tennis courts and a waterpark with waterslides. The hotel has an outdoor pool, a children's pool, and a spa tub. A sauna and a fitness center are other recreation options. The nearest major airport is Punta Cana (PUJ-Punta Cana Intl. ): 37-min drive, 25.3 mi/40.7 km.